Commemorating The Dead In Revolutionary France: Revolution And Remembrance, 1789-1799: 9780521878500 Hardcover - LIMEROCK BOOKS INC.
From the fall of the Bastille in 1789 to the coming of Napoleon ten years later, the commemoration of the dead was a recurring theme during the French Revolution. Based on extensive research across a wide range of sources, this book is the first comprehensive study of the cultural politics of commemoration in Revolutionary France. It examines what remembrance meant to the people who staged and attended ceremonies, raised monuments, listened to speeches and purchased souvenirs in memory of the Revolution's dead. It explores the political purposes these commemorations served and the conflicts they gave rise to while also examining the cultural traditions they drew upon. Above all, it asks what private ends did the Revolution's rites of memory serve? What consolation did commemoration bring to those the dead left behind, and what conflicts did this relationship between the public and the private dimensions of remembrance give rise to? 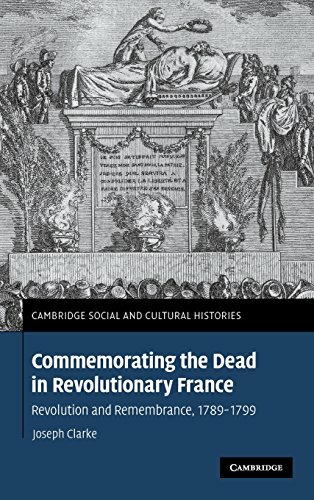 Based on extensive research across a wide range of sources, this 2007 book was the first comprehensive study of the cultural politics of commemoration in Revolutionary France. It explores the political purposes commemorations of the dead served and the conflicts they provoked, while also examining the cultural traditions they drew upon.